Chatsworth, CA - It’s a flashback fan fest for valley residents and guests as My Valley Pass presents four nights of entertainment at the Lake Balboa Complex pop up experience: Summer Drive-In Nights benefiting the Valley Relics Museum and the Martial Arts History Museum. Beginning on August 4, the event will be featuring E.T. 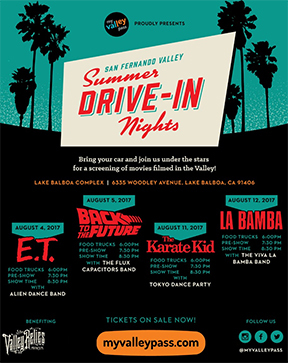 the Extraterrestrial, Back to the Future, The Karate Kid, and La Bamba in a retro drive-in setting, each evening begins with pre-show music, surprise guests, and themed entertainment. Don’t forget to come dressed in your favorite 80’s threads as there will be costume contests before each film with fun prizes donated by local valley businesses. Each film was carefully curated for its connection to the San Fernando Valley; from filming locations in neighborhoods such as Northridge, Granada Hills, and Pacoima or iconic landmarks such as the CSUN Matadome and the Cowboy Palace Saloon, each movie is linked to the history of the valley and represents a moment and time in its development. Located at the Lake Balboa Complex - 6335 Woodley Avenue, Van Nuys, CA 91406, enjoy movies under the stars with family and friends tuning in to watch a film on a giant outdoor screen. Party down with specially themed nights to each movie. Out of this world bands and flashback performances provide pre-movie enjoyment for all ages. We will be hosting a variety of popular food trucks on the property. Doors open at 6:00pm each night, and we encourage you to plan an early arrival for dinner and snacks. Pre-show entertainment begins at 7:30pm and the movie screening begins at 8:30pm each evening. Ticket prices are $20 per person or a Family Pack of $60 for a car of 4 or more and can be purchased directly from MyValleyPass.com. Tickets will only be available at the door if there is still room so we recommend purchasing in advance. This event is going to be positively outrageous and tickets are expected to sell fast. Doors will be opening at 6:00 pm each night, and a variety of food trucks will be available for dinner and snacks. Check out MYVALLEYPASS on Facebook, Instagram and Twitter for a chance to win free tickets and keep up to date on valley events and happenings! Proceeds from this event will benefit the Valley Relics Museum. Located in Chatsworth, CA, the Valley Relics Museum is dedicated to preserving the history of America’s most famous valley and the Martial Arts History Museum, located in Burbank, CA, an educational and cultural facility. Memorabilia from matchboxes to neon signs, the museum endeavors to collect, preserve, interpret, and present the history of The San Fernando Valley and surrounding areas in order to share the stories of those who shaped the region and its role in the nation’s development.